THERE IS A STRONG SOCIAL component to the reasons patients use to justify requesting the implantation of artificial hair. As well as the individual’s dissatisfaction with their image, such requests often derive from the hope of correcting psychological unease or disturbances1,2. There are also individuals whose appearance has been severely altered by pathologies for which no solution has been found, or the after-effects of surgery, as well as physical and mechanical trauma3,4. Female patients are particularly vulnerable to experiencing the psychological impact of hair loss and hair thinning5,6. In all these cases, the aim of the implantation of biocompatible artificial hair is to reconstruct the individual, and so it is essential to offer satisfactory functionality and results7,8. The latest Automatic Biofibre® Hair Implant System9 allows for fast results with negligible trauma, and the reversible anchoring of the fibres means they can be removed if necessary without lasting scars10. This provides the patient with an additional motive for desiring the benefits implantation is expected to provide. The improper use of this technique during the pioneering era was part of an evolutionary process, which ended in 1995 when the European Union and the Australian Authorities approved and set out rules for the treatment’s proper use11,12. During the last decade, the quality of artificial hair implant fibres and the implantation procedures improved significantly. The main characteristics required for a hair implant fibre are high biocompatibility; absence of capillarity and bacterial adhesion; high flexibility, elasticity, and resistance to traction; minimal tissue trauma; resistance to physical-chemical stress, and a natural aesthetic appearance. The artificial hair used by the author is Biofibre® hair by Medicap. It is a CE/TGA certified medical device composed of a mixture of medical grade polyamides dyed with inert inorganic pigments internally incorporated during the extrusion. This is a very important safety aspect in order to avoid pigment migration, as occurred in the old generation of artificial hair, as it can lead to inflammation and infection problems13,14. Another essential safety feature is represented by the possibility to completely remove the implanted fibres, if required, without leaving any residue. Biofibre® hair is available in 13 colours, four different shapes (straight, wavy, curly and afro) and three different lengths to satisfy all patient requests. It is also available in a high-density version, which allows each implant to have three hairs. The high-density fibre is used only for the crown area and for extensive baldness whereas for front-line or hair thinning a single fibre is recommended. That fibre can be washed, dried, coloured in darker shades (with ammonia free and resorcinol free dyes), but they can’t be permed, and they can’t be bleached or submitted to high temperature.This implant procedure is performed by an automatic implant device designed and patented by Medicap, Italy. The device holds the body of the instrument which contains a thin needle (0.25 mm). The device is practical and functional, and it also comes with an option to allow the practitioner to adjust the needle’s length to obtain the necessary implant depth for the thickness of the skin in different scalp areas. 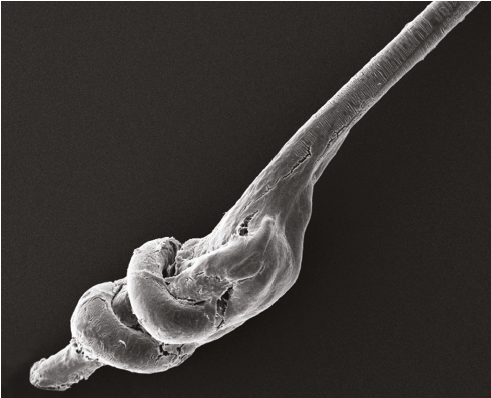 The end of the needle includes a unique hook to connect to the hair from the knot end and place that in the aponeurotic galea without trauma. This automatic device allows 800 artificial hair implantations per hour with minimal patient discomfort.It is important to remember that the success of the procedure depends on the safety of the fibres, the use of the correct implant instruments, trained qualified doctors, patient selection, and complied with post-procedure care. 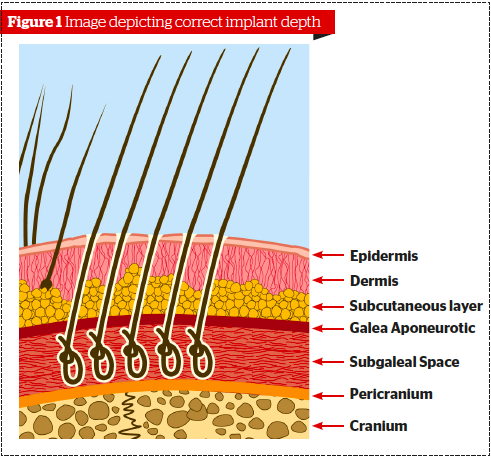 Biocompatible artificial hair implants have multiple indications, including the treatment of androgenic alopecia, general hair thinning, depletion of a donor area for hair transplant, and scalp scars or scalp burns. It can be used alone or in combination with other hair restoration techniques and is indicated for both male and female patients. 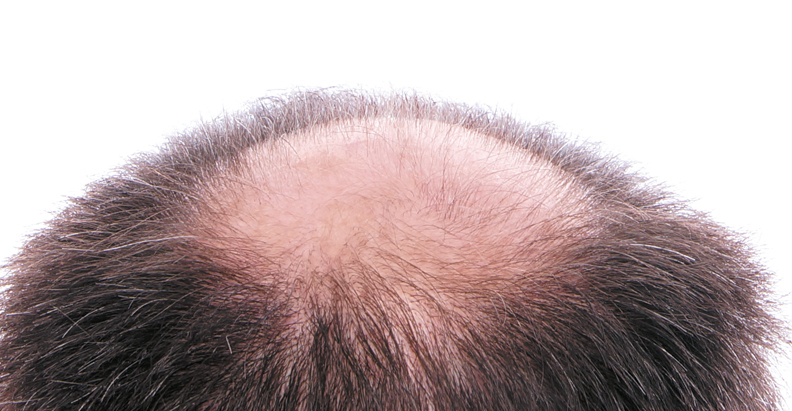 However, this technique is not indicated for implant on the temples; on low frontal hairline; scalp areas with very thin dermal tissue; for non-stabilised alopecia, such as alopecia areata; or in cases of a pathologically atrophic scalp. Patients were selected on the basis of a satisfactory history and physical examination.Criteria for exclusion included: significant seborrhea, chronic scalp inflammation, eczematous diseases, mycosis, severe hypomania states, psychosis, chronic metabolic disorders, allergies, immunodeficiency, and poor personal hygiene.A preliminary screening of the patient, including blood testing, is essential before proceeding with an implant test. To correctly perform the automatic Biofibre® hair implant technique the following steps are mandatory: preoperative patient selection, appropriate implant equipment, asepsis of operation field, preparation of the patient scalp if necessary, correct implant technique, compatibility test, post-operative treatment and drug prescription, aftercare patient instruction, periodical dermatological check-ups, and post-implant management.Selection of a suitable patient is essential. A preliminary medical screening and focused blood tests allow for the exclusion of those patients who have contraindicating skin conditions to be submitted for an artificial hair implant15,16.Furthermore, a consequent tolerance implant test allows for the exclusion of those patients who are not suitable for the artificial hair implants for sensitive personal reasons. The tolerance implant test is usually performed with 100 fibres, and results are evaluated over 5 weeks. Patient must avoid smoking, drinking alcohol for 2 days before implant, and avoid taking salicylic acid for one week before surgery. If no significant problems are observed larger sessions can be performed at intervals of one month each in different scalp areas until the expected result is achieved. The patients appreciate the gradual aesthetic change as it is easier to mask the fact they have had treatment.The implant technique is based on small hooking needles that extend from the implanter and hook the Biofibre® reversible knot, placing it under the scalp at galea level. Using this method, the root can be held by the fibrous tissue and avoid premature hair loss. The implantation performed by the Automatic Biofibre Hair Implant System allows the practitioner to always implant at the correct depth and with the proper orientation (Figure 1).The area to be implanted is cleaned, disinfected and draped. Xylocaine 2% solution with adrenalin 1:100,000 is locally injected into the subdermal layer with 30G needles for local anaesthesia and vasoconstriction under strict aseptic conditions. It is recommended that a spacing of 2 mm is allowed between implanted fibres to avoid groupings. If two or more fibres are implanted in the same hole they have to be immediately removed to avoid infection. The implant of MHD triple fibres requires special precaution. The linking knot of these fibres has to always remain outside the scalp or the practitioner would face the case of multiple fibres in the same hole and the possibility of infection.For the front hairline, always implant fibres in a zig-zag and staggered manner because a line which is too regular and straight looks very unnatural.Some areas can’t be implanted successfully. The temples are very vascularized areas and should be avoided. Implanting on the sideburns and the frontal muscle should also be avoided.Before, during, and on completing the implantation, the scalp was thoroughly cleansed with an antiseptic solution. During implantation be careful not to apply any traction on the newly implanted fibres as the fibres will be pulled up in one of the superficial layers of the scalp resulting in premature fall of the fibres. There is a little bleeding associated with this procedure.On concluding implantation, ice wrapped in gauze is applied for 5–10 mins to reduce implant inflammation. 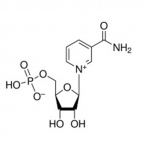 A broad spectrum antibiotic such as gentamycin is applied locally. Without applying any traction the hairs are gently combed, and the extra length of the fibres is cut accordingly.Normal activities were resumed immediately after implant without hospitalisation. At home, cleaning and disinfection of the scalp with the prescribed products and the respect of the prescribed drugs were believed to contribute to a successful outcome. A list of unsuitable or forbidden products was delivered to the patients. A 7 day course of oral antibiotics was administered. Patients can begin shampooing their hair from the third day onwards. An antiseptic shampoo such as 2% Cetrilak shampoo is recommended twice a week. The first and foremost care of artificial hair implant includes regular cleansing of the scalp. The hair should be washed frequently to remove dust, dirt, sebum and sweat. A high-quality neutral shampoo can be used for this purpose. Timely use of antiseptic spray or lotion and ketoconazole shampoo is also advocated. All these products are suitable for Biofibre®. The importance of delicate combing can’t be ignored. It should be clearly explained to all the patients that they have to comb their hair gently to avoid traction and premature fall.The first medical check-up is required at 4–5 weeks or before, dependant on patient needs. Use of local anti-inflammatory therapies and systemic anti-stamina therapy is recommended in cases requiring large implant sessions. Each colleague can change the prescription according to their dermatologic experience and climate. For example, in some very humid areas the use of antifungal medication in the aftercare is quite frequent. The use of LED when available is also recommended to facilitate the scalp healing.Comedos are quite common and they generally start forming after a few months of implantation. Comedo is nothing but collected sebum around the fibres. Timely removal of comedo is very important not only because they may look unsightly but also to prevent infection and premature fall of the fibre. Comedos formation should be prevented with proper keratolytic products to reduce sebum accumulation and with suitable treatments performed at the clinic and at home. This will decrease the risk of infection and prevent scalp pits17. No surgical procedure is without complications. Similarly, this procedure has certain limitations and side-effects associated with it. Recent clinical studies9,18,19 conducted on 327 patients (260 male; 67 female), with an average of 2,300 Biofibre® hair implants for each patient, confirm the positive results already published in the literature on more than 1500 patients, with a similar side-effect rate. Foreign body reaction is rare and seen in around 2% of cases after implant test. Mild side-effects including localised slight inflammation and infection were recorded in around 6% of cases. These pathologies improved thanks to topical anti-inflammatory and antibiotic therapy in around 10–12 days. In cases of recurrent problems, systemic therapy such as teicoplanin or minocycline cycles were added. Moderate inflammation and infections appeared in around 3% of cases. Dioxidine use has shown positive effects on resistant infections but when such infections are recurrent, and may lead to patient discomfort, fibres removal is required. For the correct removal of fibres, it is necessary to seize the fibre near the entry point with a tweezer and then gently pull the fibre along the direction of implantation with a waving motion, careful not to break the fibre. All the explanted fibres must be checked for the presence of knots to ensure complete removal (Figure 2). No lasting scars occurred after fibre removal20. Some patients complained of mild itch that appeared to be related to sebum build-up. It was relieved by shampoo, sebum debridement or the application of steroid lotion in persistent cases. The yearly rate of fibre loss was variable from patient to patient and the average annual fibre loss rate observed was 10%. The use of the automatic Biofibre® hair device allows for a better fixation rate and decrease in the yearly loss since it allows the practitioner to always reach the correct depth even after several hours of treatment. Small pits at the exit site of the fibres were noted several years after initial implantation. In the majority of cases, these pits were similar to those seen with natural hair thanks to the thin diameter of implanted fibres and their flexibility. In other patients, these pits appeared more marked and visible on close inspection. 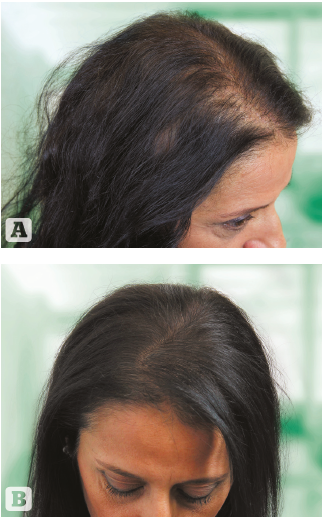 In some evident cases, injection with organic silicium is useful to make the scalp smoother and reduce the depression. Rare cases of breakage and curling of fibres were observed (less than 2% of cases). Subjective and objective satisfaction with the cosmetic and psychological impact was achieved for the majority of the patients both male and female (around 95% of patients). Histological studies after 2, 3, and 5 years on Biofibre® hair21,22 have shown that the implanted fibres appear surrounded by a keratin layer which seems to be compact and to adhere closely to the fibres in the uppermost sections and to be separate from them by a basket-like structure, hindering bacterial penetration. Thin diameters and proper distances between the fibres reduced the occurrence of implant rejection. No dyes or pigment were noticed outside the fibres. Fibrosis appears in the second week after implantation and keeps growing until the third month, remaining unchanged until the 24th month. Although modifications vary depending on the anatomical structures in the path of the fibre, the inflammatory phenomena are extremely limited and do not produce clinically evident signs of inflammation. Such histological changes are not different from those that follow cutaneous and/or subcutaneous implantation of any other biocompatible material. 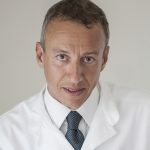 On the basis of results obtained, it is the opinion of many expert physicians that the best solution for alopecia is often based on a combination of multiple therapies23–25. Hair transplants (FUE and FUT) and artificial hair implants are often used in combination to achieve a natural aesthetic result and a high density of hair in case of poor donor area. In that way, patients with exhausted donor areas, caught in the limbo of unsatisfactory results, could benefit from technological improvements in artificial hair treatments that have occurred through the years26,27. 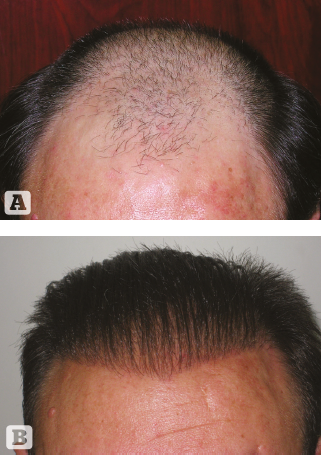 A total of 363 cases of patients previously treated with hair transplant have been reported28. These patients were not satisfied with their final aesthetic result and subsequently chose to undergo further treatment with Biofibre® hair. Patient selection was performed. 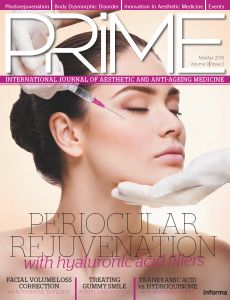 Healing time was short, minimal discomfort was experienced, and the desired aesthetic result was achieved. The auto-transplanted hairs were not damaged as the distance between natural hair and artificial hair was respected. The average number of implanted fibres was 2100. 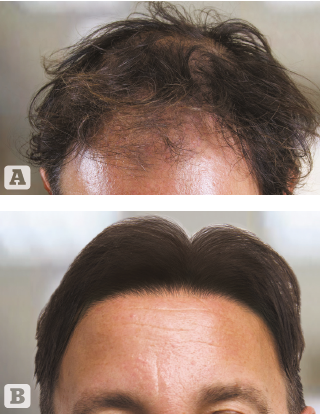 Before proceeding with artificial hair implants it is important that auto-transplant healing took place completely and the area to be implanted regained its normal aspect. The best choice would be to wait for new follicles to grow before proceeding with the artificial hair implant. Conditions for the success of the implant are suitable patient selection, healthy scalp, compliance with the implant and post-implant medical protocol, correct patient after-care, and periodical medical check-up. The use of a small implant needle and new soft Biofibre® Automatic hair device is propaedeutic to long-lasting satisfactory results. The implant of soft and thin diameter biocompatible artificial hair represents a substantial advantage since it reduces the risk of pitting and complications. According to the author’s experience, the majority of unsatisfactory cases are due to post-operative complications which lead to premature fibre loss. Patients affected by skin diseases, diabetes, hepatitis, allergy detected while collecting patient’s history, immune system deficit, autoimmune diseases, psychological instability, working in a dirty environment or with unrealistic expectations, are candidates at risk and have to be avoided. Studies on safety, effectiveness, and tolerability of the product as well as quality of life improvement, and psychosocial impact post-procedure showed positive results.